Going into the latest Star Wars movie, I realized that I was 23 when the first Star Wars was released in May, 1977. Who would have guessed then that it would have become a global phenomenon and is still going strong 40 years later? In the last film of the sequence, The Force Awakens, Han Solo (Harrison Ford) is killed. In the final scene of the movie, young Rey (Daisy Ridley) finds Luke Skywalker (Mark Hamill) on a remote island. What part will Luke play in The Last Jedi? 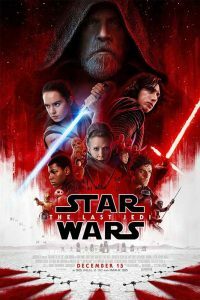 As The Last Jedi begins, Rey tries to convince Luke to return to help the Resistance, headed by Princess (now General) Leia (Carrie Fisher), combat the evil First Order, headed by Kylo Ren (Adam Driver), the son of Han Solo and Leia. Rey also wants Luke to train her in the way of the Jedi. Luke tells Rey that he has given up after the last Jedi he trained, Kylo Ren, turned against him. The emotional heart of the film, before it even begins, is of course Carrie Fisher, in her last performance before her death a year ago. Fisher is wonderful, now older and wiser. Every scene she is in has an added poignancy, especially those she shares with Hamill. For Boomers like me, it’s great to see them together for the last time. Like the second (and still best) of all the Star Wars movies, The Empire Strikes Back, Last Jedi doesn’t have a clear beginning or end. It’s one of a new triad (at least). Unfortunately Last Jedi doesn’t have the emotional resonance of Empire. Writer-director Rian Johnson, under the watchful eye of executive producer George Lucas, has many battle scenes, and more subplots than I could count. At 2 ½ hours, the film is way too long. On the positive side, the special effects are first rate and it’s a treat to hear the great John Williams score. Along with the young cast, which will appear in the next film in the series, it’s also good to see such veterans as Laura Dern, as Vice Admiral Hodo, and Benicio del Toro, as codebreaker DJ, who adds some much needed comic relief. And our old friends Chewbacca, C-3PO, R2D2, and Yoda all appear briefly, although they have little to do. Unfortunately, however, Last Jedi seems unfocused, as if Lucas, Johnson, and the other filmmakers threw together different elements from the other Star Wars movies together, hoping it would work. There’s nothing especially compelling about the new characters that would encourage me to come back for the next film in two more years. I’m still glad I saw The Last Jedi if for no other reason than to say goodbye to Carrie Fisher as Leia. Without giving anything away, it seems doubtful that Mark Hamill will return as Luke either. Even though the Star Wars saga will continue, The Last Jedi is the end of an era that began 40 years ago.